In my previous posting I reviewed the issue of the Jehovah’s Witnesses and their wish to use Jobing.com Arena. The other contentious issue of discussion on the City Council workshop of March 5, 2013, was the Tohono O’odham (TO) casino issue. At the end of every workshop councilmembers are asked if they have any “Items of Interest” about which they would like further staff information. All councilmembers, with the exception of Councilmember Alvarez, had no follow up items. Councilmember Alvarez, for the umpteenth time, brought up the issue of the TO casino and questioned Glendale’s position and expenditures to fight the casino in court. She also made the astounding observation that she didn’t know why the city was fighting the casino. Really? Really? Does she live under a rock? Or do her blinders only allow her to acknowledge those issues with which she is in full agreement? I especially appreciated her reference to the casino as a “resort.” Sounds so benign, doesn’t it? Rather than a 1.2 million square foot casino with over a 1,000 gaming machines, 50 table games, 25 poker tables and a 1,000 seat bingo hall. On the other hand, the mayor called a spade, a spade and referred to the facility as a casino-resort. Ever since the Tohono O’Odham appeared at City Hall in 2009 to announce they were coming and building a casino (on the very same day they issued a press release about same), the topic has been a hot one in Glendale. To say that she does not know the city’s position is the height of folly. It immediately hit the media big time. The city has had its position posted on its website for years. 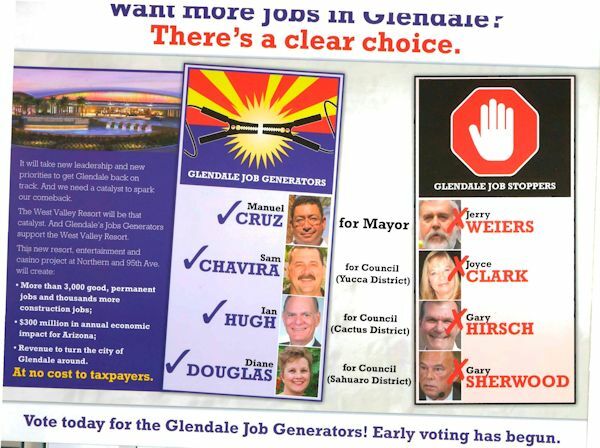 You can go to www.glendaleaz.com/indianreservation/ to see for yourself. A majority of council has given direction to continue to oppose this development and at countless council meetings Councilmember Alvarez and those of us who oppose the casino have openly debated the issue. She knows full well why the city opposes the casino and her claim that she does not is disingenuous. Why did she bring it forward…again? Very simple, she’s hoping to garner more favorable publicity for the Tribe in addition to hoping that a majority of council will now support the Tribe. And why shouldn’t she? After all, the Tohono O’odham generously supported her campaign for her council seat and in this past election cycle it also generously supported her anointed candidates, Ian Hugh and Sam Chavira. She has hosted the TO at her campaign events and even had a TO representative at her home for a meeting that may have violated the state’s Open Meeting Law. Is it just a matter of her definition of the” right thing to do” or does she owe them big time? You can decide for yourselves. Another issue that may be of concern to you regarding Councilmember Alvarez’ actions is that the city is actively in litigation with the Tohono O’odham and has been since before her successful bid to become a councilmember. From listening to others who have been involved in litigation they have related that they are instructed to talk to no one about their case, especially their legal adversary. As elected officials representing the city in active litigation we have all been cautioned in that manner. Yet, Alvarez persists in meeting with representatives of the Tribe and has tried to raise their positive visibility in Glendale. Do the rules that the rest of council follows not apply to her? Or is it a case of when she has hears something she doesn’t agree with or like, she feigns ignorance? Again, you decide. I’ll reserve a future blog for further discussion of the issues surrounding the casino. Who knows, it may even refresh Councilmember Alvarez’ memory. The use of language in that meeting was very political, I also noticed the lack of the word “casino”, CM Alvarez is getting some coaching somewhere. The entire presentation about the group that wanted to rent the arena was bereft of the name of the group until Manny Martinez insisted on hearing the name of the group. I think it’s deplorable that the City of Glendale would make concessions in rental of the arena to one group over another. Who was it that said something to the effect of, “Isn’t the arena for making money?” Oh, yes, that was CM Norma Alvarez when speaking about the Coyotes. The City can’t have it both ways, can it? And speaking of CM Alvarez, Her ignorance is laughable. She knows damn well that she shouldn’t be hobnobbing with people/organizations that the City is in litigation with. But she owes a lot to the tribe, like two council seats and possibly even her own. This alone would be reason enough for a recall.